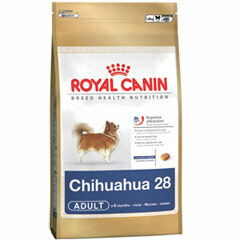 Royal Canin Breed Specific Chihuahua 3kg is for dogs of this breed over 8 months old. It helps to stimulate even the fussiest of Chihuahuas with kibble that has been specially adapted to the Chihuahuas jaw. It also works to reduce the volume and odour of stools and reduces the formation of tartar with Calcium chelators and a tailor-made dental kibble.